Drum Dryer & Agitating Dryer Collaboration System (D.A.C.) 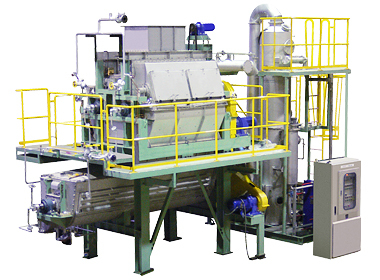 | KATSURAGI INDUSTORY CO.,LTD.- Dryers,Drum Flakers,Concentrators,Crystllizers. 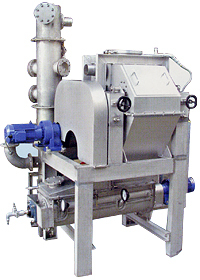 Generally, a conducted-heat transferring dryer is used for the conventional sludge dryer. However, when drying dewatered sludge or food residue, the conducted-heat transferring dryer had problems that made drying difficult such as adhesion of dried materials on the heat-transfer surface during the drying process and granulation or agglomeration of dried materials. Drum Dryer & Agitating Dryer Collaboration System (D.A.C.) developed by Katsuragi Industry has solved these problems all at once. Drum Dryer & Agitating Dryer Collaboration System (D.A.C.) was named from the initial characters of the collaboration system which integrated Drum Dryer and Agitating Dryer. It is an innovative dryer making the best use of the advantages of both dryers. Sludge which was difficult to dry until now and sludge which required long time for drying due to adhesion on the heat-transfer surface can be dried in a short time without adhering to the heat-transfer surface. It allows efficient drying in a short time. Sludge is dried by the conducted-heat transferring drum dryer with excellent heat efficiency until the adhesive property of sludge is eliminated completely, and then the dried material is dried by the agitating dryer up to the specified degree of dryness. By doing so, the heat-transfer surface of the agitating dryer can be tapped to the maximum, allowing efficient drying in a short time. The degree of dryness for dried materials can be adjusted. It became possible to adjust the degree of dryness by integrating the drum dryer and agitating dryer and changing the retention time of the agitating dryer. The agitating dryer was installed directly under the drum dryer, eliminating the need for transfer devices, etc. As a result, the system was downsized. Consideration was given to the reduction of exhaust gas and odor. Exhaust (vapor) generated from the drum dryer is condensed by the scrubber condenser. The exhaust gas and odor emitted to atmosphere were reduced by introducing the total volume or part of the exhaust gas into the agitating dryer. Since both the drum dryer and agitating dryer have simple structures and sludge does not adhere to the heat-transfer surface, operation and maintenance are easy. Before using the Drum Dryer & Agitating Dryer Collaboration System, it is absolutely necessary to confirm the property of materials to be treated using a test machine. We have test machines always available, of which specifications are indicated below, and we are ready to carry out a test as needed and present the plan of equipment. For inquiries about the test machines and products, contact us using the query form.